These are not exact amounts so play around to suit the recipe to your particular tastes. Melt the oil if yours is not already liquid (coconut oil hardens in cooler weather). Fill pot of water on stove to about an inch high. Set jar of coconut oil (if it’s a glass jar- or scoop the measured amt. of oil into an oven or microwave safe dish) and place in pot of water. Melt on very low heat for a minute or two. The heat will be so low you will still be able to comfortably set your finger in the oil. Once you notice it has melted, stir in cocoa powder until texture is smooth. Mix in the honey and continue to stir until smooth. At this point you may add the salt or vanilla if you would like. Cool a bit and pour into candy molds or into a freezer safe ramekin or dish. Let set for an hour or overnight. 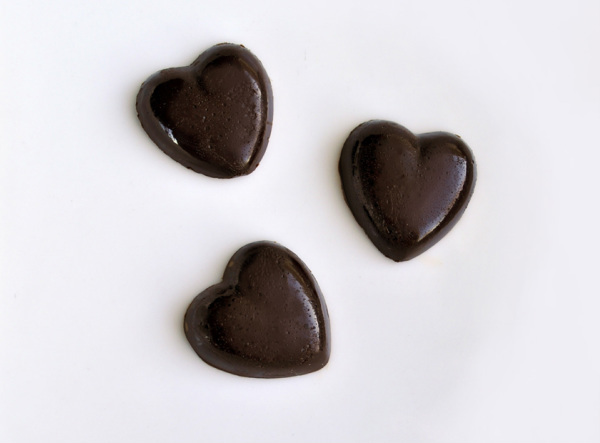 Once chocolate has set up, pop it out of the molds and enjoy a decadent treat any time a craving strikes!